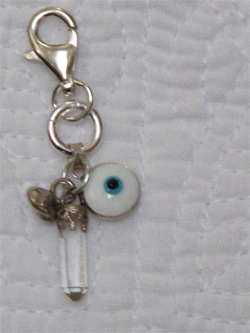 I created chi charms with the intention of helping the wearer tap into a deeper source of life energy, or "chi". This one features the 'evil eye', which has always been an amulet carrying protective properties and the ability to ward off evil. Crystals are one of the oldest known materials believed to enhance certain frequencies in our personal energy fields to aid in the manifestation of thoughts and intentions. This and the other new chi charms will arrive in my Etsy shop next week. Have a wonderful fall weekend my lovelies.